After just better than a decade of music and five full-length albums, Portland-based post-pop punk band The Thermals have found some new freshness with John Agnello (Dinosaur Jr., Sonic Youth). Their sixth full-length outing, Desperate Ground, carries a scrappy return-to-form rawness. Never mind the criticism that calls the album superficial because the band is a bit removed from its incendiary days. It's not exactly true. While this album is all about power chords and punchy vocals, the conceptual theme just happens to exist in the mind of frontman Hutch Harris. It's more biopic than activist. Desperate Ground aims at admonishing violence by celebrating it. Almost every track on Desperate Ground is part of a bigger story, piecing together the life of a lone deviant who has an unceasing urge to destroy everything. At the same time, Harris simultaneously explores whether the evolution of his rogue is nature or nurture, conditioned or conscious, callous or regretful. In fact, the album ends on a paradoxical note, with the natural born killer attempting to reconcile a life of violence as a means of peace and protection. Although the last song, Our Love Survives, rings a bit hollow, the lyrics are coherent enough to understand the sentiment. The justification doesn't hold. For many people, especially anyone unfamiliar with The Thermals, it's best to gravitate to the most brilliant tracks first and then work around the remaining 26 minutes. The Sunset is one of those standout tracks, which is made even more accessible as the story of a female boxer. If you don't know, the female boxer isn't just anyone. 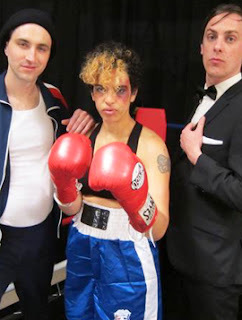 To make the video, the band tapped their own bassist Kathy Foster, who took lessons from two-time world champion boxer Molly McConnell prior to the shoot. The entire training only lasted two hours, but Foster remembers it as a rigorous workout. "It was hard work, I was tired after the first few minutes!" said Foster. "But I think I did pretty good because we sparred a little at the end of it, which she said usually never happens in the first lesson. I felt so tough!" As an obvious ode to Rocky and Raging Bull, the video provides a stronger context than the conceptual theme. Saddle Creek recently released a "making of" segment about the video. Aside from The Sunset, the lead-off track, Born To Kill, is an excellent place to start. While there isn't anything groundbreaking about the song, it's well-defined punk in terms of tempo and structure. The only problem with this, however, is that there isn't very much (if any) variation afterward. So before spiraling down the track listing, cut down to Faces Stay With Me. The two-and-a-half regretful consequence song has some variation in the chorus. Likewise, I Go Alone is also interesting in that Harris takes on the duality of emulating a war hero — dreaming of an opportunity for war and glory. And The Howl Of The Winds, which makes a great companion piece to The Sunset, deserves a listen. While there will be times listening to the album that fans may find themselves wishing for more variation or a departure from the thin conceptual thread (like the video ultimately provides), cherry-picking some gems off the album is worth it. Harris, Foster, and Westin Glass (drums) might have stretched the theme too much, but the high points capture some signature desperation and angst. For those thinking the album feels overproduced, The Thermals also released four demo versions of the album as an EP. The most noticeable and immediate difference is that the bass and midrange are lost, creating a tinny sound. Harris, however, sounds good at any occasion. Desperate Ground By The Thermals Stands 4.8 On The Liquid Hip Richter Scale. More diversity in the concept and tempo could have made the sixth album by The Thermals stronger than a stopover. Still, there are some exceptional tracks to be separated out from those that simply start to sound alike. You can also bet that no one will sweat the live version. The Thermals are as tough as the audience they attract. Desperate Ground by The Thermals can be found on Amazon. You can also order the album from Barnes & Noble or download it from iTunes. The demo EP is also available on iTunes. The Thermals have an aggressive touring schedule in Austria, Denmark, and Holland this October. They are currently playing select shows and festivals in the United States. For updates, visit them on Facebook.